| MATERIAL | These heels are made out of 100% italian leather and are made in Montopoli in Val D’Arno, Italy. The leather is not as thick or stiff as their loafers or oxfords but still feels sturdy. I can tell that they will soften nicely over time. | FIT | These heels actually fit true to size. I am a normal size 7 in shoes and have normally had to go up half a size in everlane’s shoes. This was especially the case for the modern loafer and brixton boot but for the day heel my normal size worked perfectly. I’ve heard that some people have had issues with the scrunched back rubbing them and causing blisters. I personally have not had these issues but wanted to mention it. I had a slight rubbing on the tops of my toes after being on my feet for 8 hours. They didn’t cause any blisters but I did notice a little tenderness. I believe this was due to A. being on my feet all day and B. the shoes were still very new. | COMFORT LEVEL | Comfort level is super high on this one. The heel height is 2” making it very manageable if you need to be on your feet all day. They should call them the All Day Heel...am I right?! Ha, sorry couldn’t help myself :) I also really like the scrunched back because it gives the shoe a little extra wiggle room and it makes it not so tight on my heel/back part of my ankle. | STYLING | I dare you to try and find an outfit that doesn’t work with these heels. When I'm looking to add a piece to my closet I always brainstorm to see how many outfits I can make with that new item to check its' versatility. These babies have got the versatility factor on lock down! 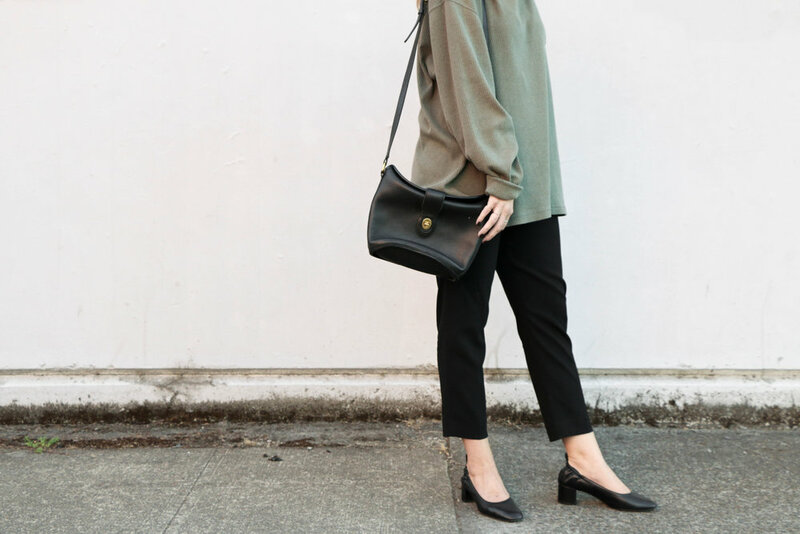 I would pair these beauties with anything from dresses/skirts to mom jeans and a tee - which I've already done :) But for my look today I decided to keep it minimal by incorporating only two colors, olive & black. The oversized mock neck is my cozy piece while the tapered trousers and heels dress it up a bit. Top it off with a statement earring and classic bag and you're ready for any lunch meeting! | CLEANING | Everlane’s site suggests that you spray these with a leather protector. I personally like Kiwi’s Boot Protector (I used it on my Brixton Boots and it worked great!). I have yet to spray these but definitely will before I wear them out on a potentially rainy day. For every day up keep clean with a leather cleaner and mircrofiber cloth. For the suede version, treat with suede protectant. If you're thinking about buying these shoes and have more questions before you decide to invest please let me know!